Oldtone and Hancock Shaker Village are hosting a gathering in the Berkshires for Old-time enthusiasts.The annual Northeast Fiddlers’ Convention is inspired by the great Southern old-time music conventions. Participants are invited to jam, compete, learn, eat, dance and celebrate together in an atmosphere of participation. We are dedicated to the preservation of the rich old-time music culture, and are honored to be able to host this Northeastern U.S. event. This year’s convention features instrument and historical workshops with The Down Hill Strugglers, John Cohen, and Erika Ludwig of Berkshire Strings. In addition the traditional all day pickin’ there will be instrument and band contests, film screening, a gospel brunch, and a square dance with live music from the Down Hill Strugglers. Historic demonstrations from Hancock Shaker Village, Shaker exhibits are also available throughout this living museum. ALL DAY PICKIN’ ENCOURAGED! Participation is Preservation! We will have chairs in nooks and crannies throughout the site for you and your friends to hang out and jam. Beer, beverages, and local food available all day provided by the Hancock Shaker Beer & Wine Bar, Sky View Farm. No outside food and beverages are permitted at this event. This year we are happy to invite attendees to camp with us at the Hancock Shaker Village. RVs, Car & Tent camping are welcome. This will be festival field camping, with no hook-ups or services other than water and bathrooms. More information and a separate "Camping Ticket” will be available shortly! Campers are welcome to arrive on the grounds as early at 1pm on Friday and stay Friday and Saturday nights. The Village and the campground will be closed by 4pm on Sunday. We look forward to pickin’ with you all weekend at Hancock Shaker Village! Space is limited, and walk-ins are not guaranteed a contestant spot. Fill out the form below or email Maggie@oldtonemusicfestival.com to register for the contests. 2nd Prize Band Contest: $100 CASH! Contestants may sign up for more than one category. However, contestants in the band contest may only perform in ONE Band. Contestant must show respect to their fellow contestants, the judges, the MC, and the venue! Genre differences such as Old Time and Bluegrass are judged together in a single category. Contests start at 5pm in this order: dobro, mandolin, guitar, banjo and then fiddle. If you already have an Oldtone Fest ticket, you may give your winning ticket to someone. *If we do not receive the required quota of contestants per instrument category, a category may be cancelled up to four days prior to the event. Contestants will be emailed about any changes to the contests. The NE Fiddlers’ Convention will feature workshops by Eli Smith, Jackson Lynch, Walker Shepard, John Cohen, and Erika Ludwig. Hands-on, all skill-levels included in fiddle, guitar, mandolin, banjo, and storytelling will be featured throughout the Shaker Village campus. Workshops will take place rain or shine in the beautiful historic buildings. We anticipate workshops to be small in size and intimate, which is a good opportunity for engagement with the leaders. No sign-ups are necessary for the workshops, and reservations are not accepted. The Down Hill Strugglers** is an old time string band based simultaneously out of Kentucky, Louisiana and New York. They have released an album on Smithsonian Folkways Recordings and are featured on the soundtrack to the Coen Brothers film, Inside Llewyn Davis produced by T-Bone Burnett. The Down Hill Strugglers band formed while hanging out at the home of their mutual friend Peter Stampfel of the Holy Modal Rounders, where they also met friend and mentor John Cohen of the New Lost City Ramblers. By carrying the music of the old rural America forward, The Down Hill Strugglers are extending the legacy of the New Lost City Ramblers by bringing archaic sounds into the present, and challenge audiences reject a dystopian future animated by disco beats and their ilk. The Greek legend of Sisyphus is: "Sisyphus (/ˈsɪsɪfəs/; Greek: Σίσυφος, Sísyphos) was a king of Ephyra (now known as Corinth) punished for chronic deceitfulness by being compelled to roll an immense boulder up a hill, only to watch it roll back down, and to repeat this action forever." The Down Hill Strugglers are the opposite, desperately struggling to keep a huge boulder from rolling down a hill. "Many string bands have the tunes but not the chops. Some have chops and tunes, but can't achieve lift-off, marching along politely like so many historical reenactors. But the Down Hill Strugglers hit the trifecta, pulling their bows deftly across the best numbers in the old-time songbook with more grit and style than just about any group fiddling away today." - Nathan Salsburg, Curator, Alan Lomax Archive. 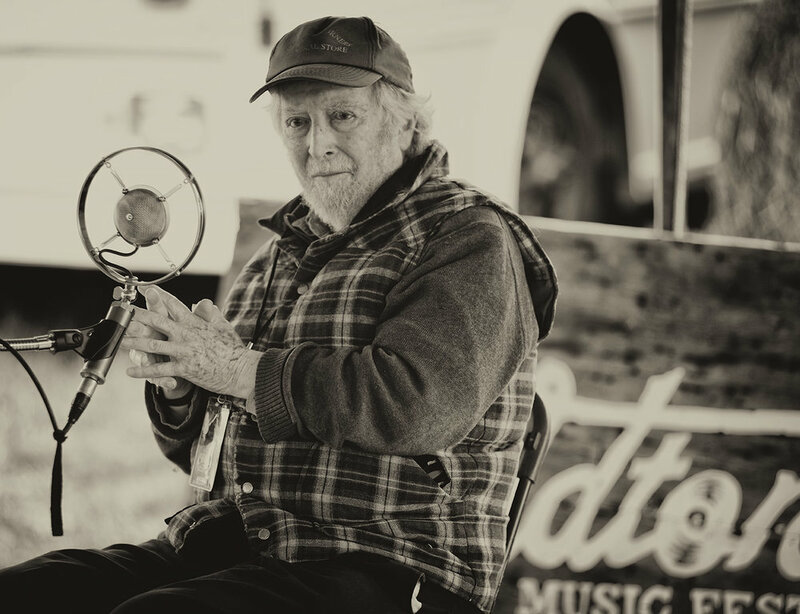 The Smithsonian Network’s film “Play On, John: A Life In Music” explores John Cohen’s long involvement with traditional music, including vintage performances with the seminal old time string band “The New Lost City Ramblers,” and live music performances with Pete Seeger, Rayna Gellert and Bruce Molsky. Cohen’s documented the well known and traditional musicians in his photographs, as well as producing several documentary films on traditional music in Appalachia and around the world, including Scotland, the Peruvian Andes. Although he is best known as a musician, his photographs and films have been recognized by museums, galleries and at film festivals worldwide. His campaign for the recognition of traditional roots/folk music has led to the production of fifteen films, hundreds of photographs and sound recordings. He has also made more than twenty recordings with the New Lost City Ramblers, along with related articles, liner notes and interviews about music. "Ms. Erika", founder of Berkshire Strings and Fiddling Femmes, is a teacher, director and promoter. Her studio in South Egremont, MA, provides private lessons and classes, hosts the Fiddling Femmes: Group Lessons for Women, and the Berkshire Strings Jam Sessions. The Studio mission of "Instruction and Inspiration" brings musical artists to the area for workshops and concerts. Erika plays violin, viola, recorder, piano, mandolin and guitar, composes songs and performs on rare occasion. Berkshire Summer Strings is in it's 5th year, celebrating of a growing community of youth musicians, devoted adult student groups and a dedicated, talented staff. Tickets cover entry to Hancock Shaker Village galleries and buildings and participation in all workshops, round stone barn jam, contests, performances and dances while on site. Also full access to the grounds, 20 historic buildings, and hiking trails at Hancock Shaker Village, a 750-acre property dating back to 1790. Free Hancock Shaker Village demonstrations available from 10-4 will include: an introduction to the Shakers talk, a farm and garden tour, a water turbine demonstration, a Shaker music and dance demonstration, a tour of the historic round stone barn and a medicinal herb garden talk. Congratulations to the 2018 NEFC Contest Winners!